Added on 12 September 2018 . By Anisah Audu. Move over greasy 3am kebab; Berenjak is giving a new lease of life to the meaty favourite. Founder and chef Kian Samyani, of the acclaimed Gymkhana and Brigadiers, has teamed up with Jyo, Karam and Sunaina Sethi of JKS restaurants; the family trio who run the aforementioned venues alongside Hoppers, Trishna and more. Inspired by Kian's Iranian heritage, this new Soho spot will pay homage to the classic hole in the wall kebab houses found in Tehran. From Persian rugs, to the open plan kitchen and communal tables, the restaurant centres on sharing and traditional Iranian dining. This theme is echoed in the dishes; think punchy small plates like blackened aubergine and Azerbaijani bean and noodle soup, to authentic kebabs fired up on a charcoal mangal grill. 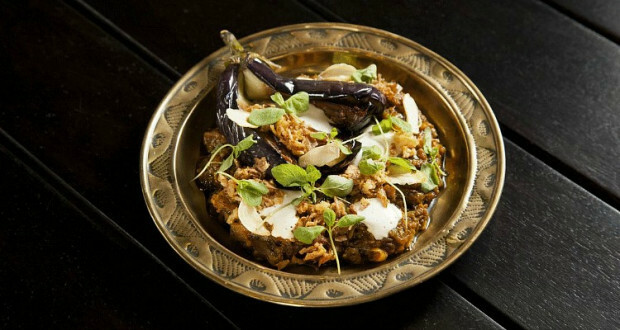 There's Jigar with lamb’s liver, bergamot and lavash, the staple minced meat Koobideh, and even spiced partridge and pheasant during game season. If this hasn't piqued your interest yet, then head to the bar for sharbat; a traditional Persian drink made from fruit, flower sherbets and sparkling water. You can customise to your preference, with fresh herbs from the living wall which doubles up as Berenjak’s sabzi garden. Is This London's Sexiest Basement Bar?